Early Morning Open Thread: Happy Birthday, JSF! by Anne Laurieat2:50 am on May 12, 2013 . It has 28 Comments. If I remember correctly, it’s May 12 in Just Some Fuckhead’s timezone now, and he mentioned the natal anniversary last evening. Okay, I’ve been looking for an opportunity to use this particular clip, but seriously: Best wishes and many happy returns to an internet mensch. This post is in Music, Open Thread, Rare Sincerity and has 28 Comments. https://www.balloon-juice.com/wp-content/uploads/2015/11/balloon_juice_header_logo_grey.jpg 0 0 Anne Laurie https://www.balloon-juice.com/wp-content/uploads/2015/11/balloon_juice_header_logo_grey.jpg Anne Laurie2013-05-12 02:50:582013-05-12 02:50:58Early Morning Open Thread: Happy Birthday, JSF! by Tom Levensonat1:52 pm on April 22, 2013 . It has 24 Comments. This post is in Events, Rare Sincerity and has 24 Comments. by Doug!at10:19 am on April 19, 2013 . It has 270 Comments. The 9/11 attacks unnerved and staggered the U.S. in many ways, provoking responses that politically divide the nation even now. But two very bad things that might have happened did not. One was a systematic backlash against American Muslims. Prejudice obviously exists: In a comprehensive 2011 Gallup Poll, Muslims were more likely than Americans of other religious backgrounds to report discrimination. But Muslims never faced anything comparable to the recoil against foreign communities in the U.S. during World War I or World War II; the examples of places resisting the operation of mosques, for instance, draw attention precisely because they are exceptions. (One 2011 study found more than 2,000 mosques operating in the United States.) The 2011 Gallup survey concluded, “A majority of Americans of every faith see Muslim Americans as being loyal to their country.” The poll also said that U.S. Muslims are as satisfied as Americans from other religious backgrounds with their lives today—and more optimistic about their prospects five years down the road. One of America’s greatest strengths is its almost infinite capacity to include, absorb, and integrate new groups. It’s a revealing coincidence that the Boston attack took place on what Major League Baseball now observes as Jackie Robinson Day—celebrating the achievement of a racial pioneer whom many in his day scorned and resisted. In America, walls fall, sooner or later. Our amalgamating capacity obviously doesn’t erase all of our differences. Our politics are ominously and stubbornly polarized along overlapping lines of race, generation, education, region, and religious faith. But a society forever absorbing the new dissolves alienation and disrupts radicalization. So long as the instinct to include remains common in America, attacks like the one in Boston will remain rare. This is Jackie Robinson’s country, not Pam Geller’s. This post is in Rare Sincerity and has 270 Comments. by Tom Levensonat9:29 am on April 19, 2013 . It has 114 Comments. Some notes — first, thanks for good thoughts sent our way. My family and I are all OK. We actually are visiting a very ill relative out of town, so nowhere near any of the mess. All my wonderful students are OK, I believe, though I can’t imagine their state of mind. I note that those MIT students finishing up their freshman year have now seen a terrorist attack, a murder on campus, a town in lockdown — and have as some of their formative childhood memories the fall of the towers when they were around six years old. They’ve spent almost all of their lives watching the unfolding of wars of choice fought in the case of Iraq on false pretexts. They seen torture routinized and the only political process they’ve witnessed is one of persistant anti-democratic manouvering pursued by one of the two major parties in our system. Campus cops have a strange, really difficult job: they have to both police and protect in a hothouse setting full of young (and often insufficiently wise older) folk who are not always sure that the rules and norms of the wider world are more than advisory. 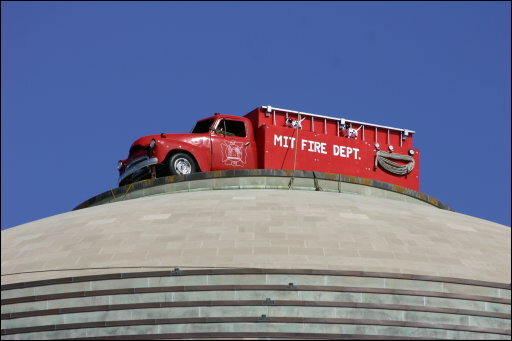 Our force at MIT manages that balancing act really, really well, especially given their charge within a university whose traditions include translocating cop cars to, shall we say, interesting coordinates. * From the report it sounds like our man was gunned down, really just executed, and I couldn’t be more enraged nor heartsick. I’ll save for a different post the political point I think most of you can probable guess. This isn’t the time. But you know I’m thinking it. I thank this community for its good wishes, its anger, its humor, and perhaps as much as anything else, its simple presence. It’s good to be able to shout, and not simply into the void. Tip of the hat to y’all — and hug those you love, two footed and four, spend time talking to folks…do all that human stuff. Images: Johann Peter Hasenclever, Jobs as a school teacher, 1845. This post is in Fucked-up-edness, Rare Sincerity and has 114 Comments. by Doug!at10:37 am on April 17, 2013 . It has 59 Comments. Lu Lingzi was a graduate student from China. I hope that the right thinks of this before they start the inevitable hate-the-furners stuff again. This post is in Rare Sincerity and has 59 Comments.